Hi friends! I've been wanting to write up a post about freezer meals for a long time. Today is the day that it is finally finished. I'm sharing all of my freezer meal making and meal prep shortcuts for the freezer secrets. At the end of the post is a list of everything I like to freeze and what I do with it. I'm going to keep it updated too. After school started back up in August, I decided to make a few freezer meals for those busy nights when I don't have time to make dinner. Every night is turning out to be a busy night, so I've loved having dinners on hand. In fact, I kind of hoard them and try not to use them. This week I've decided to use a lot of them, because, hey, I can make more. :) Totally worth the freezer prepping time! I didn't prep everything at once. I did some ground beef/turkey one night. Then I prepped some chicken dishes over a few days after I bought some chicken on sale. I always have hamburger in my freezer because my dad raises a few calves each year, so we get our beef from him. I didn't want to thaw the hamburger and then refreeze it, so I bought some ground turkey from Sam's club and used the 5 lbs to make my freezer meals. If the freezer meals would have used cooked meat, then I would have used my hamburger. We like ground turkey for a change sometimes though. Swedish Meatballs - I think I used 2.5 lbs of ground turkey to make the meatballs. We actually ate these for dinner last night. Just thaw the meatballs, then cook. Super easy and no dishes! Teriyaki Burgers - I used the other 2.5 pounds of ground turkey to form burger patties. Before I put them in the Ziploc bags, I laid them out on a cookie sheet and stuck them in the freezer for 30 minutes. Then I bagged eight of them in freezer bags with freezer paper in between layers of four. Simply defrost and grill! Tinfoil Dinners -- I used a few of my teriyaki burgers to make tinfoil dinners. I prepped them how I normally prep BBQ chicken tinfoil dinners (without the honey on top of the meat). I made 12 other chicken tinfoil dinners too. Just thaw in the fridge and then grill. They need to grill a little longer than 30 minutes. We just ate these for dinner. I loved that there were no dishes to wash afterwards! I cooked a few chicken breasts in my crockpot. Then I shredded it and used it for a few recipes. Chicken Pot Pie - I kind of follow the recipe from the New Best Recipe Cookbook, but change a few things. My daughter loves chicken pot pie (as do I). I don't use a bottom crust, just a crust that sometimes doesn't even cover the whole top of the pie. Creamy Chicken and Wild Rice Soup -- I made a double batch of this soup and froze it in containers and also in a gallon freezer bag. Just stick it in the fridge the day before you want to eat it and then heat it up at dinnertime. Chicken Strips -- cut the chicken into strips. Great for parmesan chicken strips or any kind of chicken that I want to grill. Just defrost and cook. Or better yet, marinade, then grill. Chicken Cubes -- I use this mostly for orange chicken, but is great for any recipe that you need small chunks of chicken. Crockpot Taco Chicken -- I made some homemade taco seasoning and poured it into a freezer Ziploc bag with a few whole chicken breasts. I just defrost this a little bit and cook it in my crockpot with a little water. Then I shred the chicken and use it to make chicken tacos or chicken taco salad. Asian BBQ Chicken -- This is one of my favorite quick meals. I make this Asian BBQ marinade and freeze it with some strips of chicken. Then ﻿I thaw it and grill. I serve this with a veggie and whole grain couscous. Dinner in 15 minutes or so. Easy and delicious! Chocolate Chip Cookies - I made a big batch of my favorite chocolate chip cookie dough. I baked some cookies and frozen them, so I could pull them out later for lunchboxes. I froze some cookie dough too, which may or may not have been consumed before they had a chance to be baked. 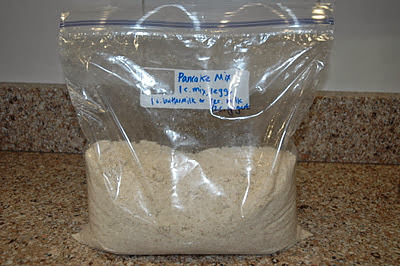 Homemade Pancake Mix -- I love this mix. It is made of ground oats, whole wheat flour, very little sugar and it already has the oil mixed up in it. Just add an egg, and a cup of milk (or buttermilk or yogurt) to a cup of mix and you have breakfast (or dinner). Homemade Granola Bars -- my kids love these in their lunches. I freeze them in snack size bags and pull them out for their lunchboxes. There are so many other possibilities of meals to stock your freezer with. I made a list of everything I freeze and how I use it and added it to the bottom of this post. I'm going to keep it updated for resource. What do you like to freeze for dinner? Spicy Honey Chicken -- mix this dry rub onto chicken. Grill and eat on green salad.